The trigBoard is a battery-powered, ESP8266-based board that includes some clever circuitry to help it barely sip power (less than one microamp!) while waiting to be triggered by a digital input. This input could be a magnetic reed switch, push button, or similar, and you can configure the board for either normally open or normally closed switches. The clever hardware bits that allow for such low power consumption are explained in [Kevin]’s YouTube video, which we’ve also embedded after the break. To summarize: the EPS8266 spends most of it’s time completely unpowered. A Texas Instruments TPL5111 power timer chip burns 35 nanoamps and wakes the ESP8266 up every hour to check on the battery. This chip also has a manual wake pin, and it’s this pin – along with more power-saving circuitry – that’s used to trigger actions based on the external input. Apparently the microcontroller can somehow distinguish between being woken up for a battery check versus a button press, so you needn’t worry about accidentally sending yourself an alert every hour. The default firmware is set up to use Pushbullet to send notifications, but of course you could do anything an EPS8266 is capable of. The code is available on the project’s wiki page. The board also includes a standard micro-JST connector for a LiPo battery, and can charge said battery through a micro-USB port. The trigBoard’s full schematic is on the wiki, and pre-built devices are available on Tindie. [Kevin]’s hardware walkthrough video is embedded after the break. Where the Hackaday Cat goes when she steps over the threshold into the wider world is a mystery, she reveals her whereabouts strictly on her terms and would we suspect be very cagey were we able to ask her about it. [Andy C] however has a need to know where his cat is spending her time, so he’s made a GPS collar for a bit of feline spying. There are commercial GPS collars for pets, but they all share the flaw of extremely limited battery life. His challenge then was to create a collar that delivered the required pinpoint fix alongside a battery life measured in months. The solution was a combination of a low-power miniature GPS receiver and a low-power PC microcontroller hooked up to an FSK radio whose frequency he doesn’t give but which we suspect is probably the usual 433 MHz. The collar remains in low power mode until it receives a call on the FSK, at which point it wakes up, gets a GPS fix, transmits it, and returns to sleep. The summary links to a series of posts which provide an extremely detailed look at all aspects of the project, and go well beyond mere GPS trackers for a cat. If you have an interest in low power devices or antenna matching for example, you’ll find a lot of interesting stuff in these pages. Of course, if all you need is a GPS tracker though, you may prefer a simpler option. The board is essentially a breakout board for the Texas Instrument BQ25504, configured to charge and maintain a single lithium-polymer cell. The BQ25504 is an integrated part that takes care of most of the heavy lifting and has nifty features like battery health monitoring and undervoltage protection. [Kris] has been using the board along with a small 2.2 Volt solar panel and a 150 mAh LiPo cell to power another project of his: the SensorTile environmental data logger. It’s a practical and useful way to test things; he says that an average of 6 hours of direct sunlight daily is just enough to keep the 1.8 mA SensorTile running indefinitely. These are small amounts of power, to be sure, but it’s free and self-sustaining which is just what a remote sensing unit needs. 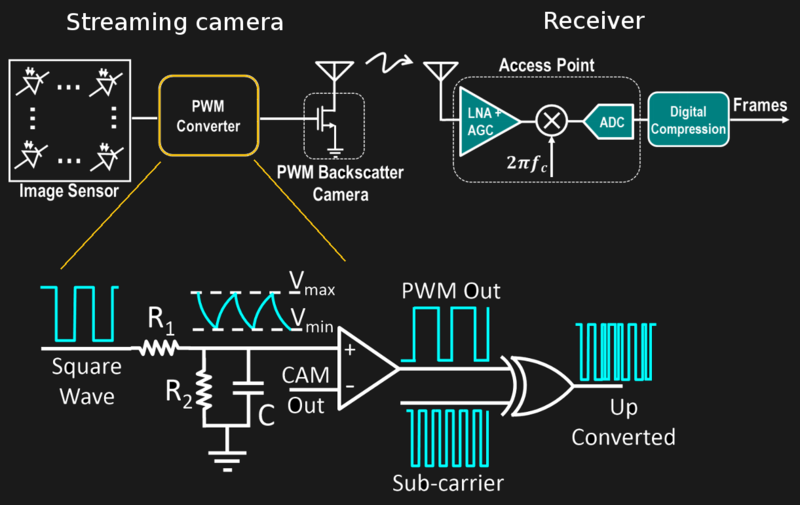 The problem is that a camera which streams HD video wirelessly to a receiver consumes over 1 watt due to the need for a digital processor and transmitter. The researchers have separated the processing hardware into the receiving unit. They then send the analog pixels from the camera sensor directly to backscatter hardware. Backscatter involves reflecting received waves back to where they came from. By adding the video signal to those reflected waves, they eliminated the need for the power-hungry transmitter. The full details are in their paper (PDF), but here are the highlights. On the camera side, the pixel voltages (CAM Out) are an analog signal which is fed into a comparator along with a triangular waveform. Wherever the triangle wave’s voltage is lower than the pixel voltage, the comparator outputs a 0, otherwise, it outputs a 1. In this way, the pixel voltage is converted to different pulse widths. The triangular waveform’s minimum and maximum voltages are selected such that they cover the full possible range of the camera voltages. The sub-carrier modulation with the XOR gate in the diagram is there to address the problem of self-interference. This is unwanted interference from the transmitter of the same frequency as the carrier. And so the PWM output is converted to a different frequency using a sub-carrier. The receiver can then filter out the interference. The XOR gate is actually part of an FPGA which also inserts frame and line synchronization patterns. They tested two different implementations with this circuit design, a 112 x 112 grayscale one at up to 13 frames per second (fps) and an HD one. Unfortunately, no HD camera on the market gives access to the raw analog pixel outputs so they took HD video from a laptop using USB and ran that through a DAC and then into their PWM converter. The USB limited it to 10 fps. The result is that video streaming at 720p and 10 fps uses as low as 250 μW and can be backscattered up to sixteen feet. They also simulated an ASIC which achieved 720p and 1080p at 60 fps using 321 μW and 806 μW respectively. See the video below for an animated explanation and a demonstration. The resulting video is quite impressive for passive power only. If the University of Washington seems familiar in the context of backscatter, that’s because we’ve previously covered their battery-free (almost) cell phone. Though they’re not the only ones experimenting with it. Here’s where backscatter is being used for a soil network. All of this involves power harvesting, and now’s a great time to start brushing up on these concepts and building your own prototypes. The Hackaday Prize includes a Power Harvesting Challenge this year. Logging data with an Arduino is old-hat for most Hackaday readers. However, [Patricia Beddows] and [Edward Mallon] had some pretty daunting requirements. Their sensors were going underground and underwater as part of an effort to study conditions underwater and in caves. They needed to be accessible, yet rugged. They didn’t want to use batteries that would be difficult to take on airplanes, but also wanted more than a year of run time. You can buy all that, of course, if you are willing to pay the price. Instead, they used off-the-shelf Arduino boards connected together inside PVC housings. Three alkaline AA batteries are compact and give them more than a year of run time. They wrote a journal paper to help other scientists use the same techniques for the Sensors journal published by the Multidisciplinary Digital Publishing Institute.